Resurface Solutions ::: Trimaco Shop Towels Box 200 Ct. Featured Products → Trimaco Shop Towels Box 200 Ct.
A heavy duty box of 200 wipes for general clean up associated with maintenance, repair, and general fix-up. This shop solution is designed to be used as a substitute for cloth rags. These wiping cloths are produced through a process that binds high-quality absorbent fibers with the strength of latex to provide cloth-like durability and softness. They are very absorbent yet soft enough to avoid scratching sensitive surfaces. The wiping cloths are white in color and are 10" x 13" in size. They are lint free, consistent in quality, and cost less to use than cloth rags. 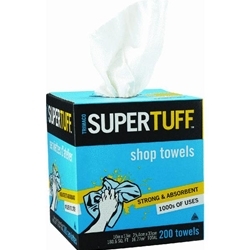 Because these cloths are lint free, they are ideal for applying X-Factor adhesion promoter. Yellow push tabs on the corner of the box makes a convenient handle.